Round two for the premium Buffy release, 2017 Rittenhouse Buffy the Vampire Slayer : The Ultimate Collectors Set Series 2 broadens the variety of cards for collectors to find. Every box includes one autograph from either Buffy or Willow. Of course, just like in the 2015 product, 2017 Rittenhouse Buffy the Vampire Slayer Ultimate Collectors Set relies heavily on the signed card found in each box. 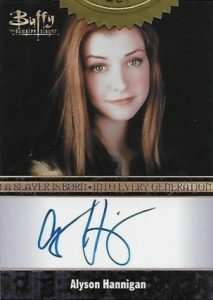 While Series 1 only contains autographs from Sarah Michelle Gellar, Series 2 ups that with either Autograph Relics for Gellar or one of two different Alyson Hannigan Autographs. 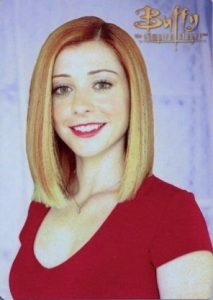 Hannigan played Willow Rosenberg in the series and also had memorable roles in the How I Met Your Mother tv series and American Pie movie franchise. Although there are only three different signed cards to pull, collectors must purchase at least five sets to guarantee all three autographs since they are produced in different quantities. In addition to the signed card per box, 2017 Rittenhouse Buffy the Vampire Slayer Ultimate Collectors Set Series 2 includes a full seven-card set of Season Montage inserts as well as one of five different Character Metal cards. Collectors who purchase five sets also receive a random Sketch card in addition to an extra set of the Metal cards. 2017 Rittenhouse Buffy the Vampire Slayer Ultimate Collectors Set Series 2 boxes retail for $399.99. 3 cards. 1 autograph per box. Shop autographs on eBay. 5 cards. 1 card per box set. Shop on eBay. 1 extra full set for every 5 sets purchased. 7 cards. 1 full set per box. Shop on eBay. 15 artists. 1 sketch card for every 5 sets purchased. Shop on eBay.